Liu Che (156-87 B.C.) 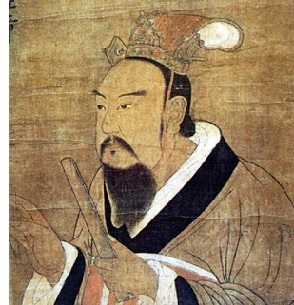 - Also known as Emperor Wu of Han, he was monarch of the Han Dynasty for 54 years (141-87 B.C. ), is regarded as perhaps its greatest emperor, and one of the greatest in China's history, even rivaling Qin Shĭ Huángdi. For unknown reasons, his father, Emperor Jing chose him as his heir at the age of only seven, despite being his 10th son. His reign is considered the golden age of the Han Empire. It was marked by economic and territorial expansion. As a military commander, he pushed China's borders west all the way into modern-day Kyrgyzstan (roughly where its present border is), captured the northern Korean peninsula, and expanded south into what is now northern Vietnam (again its present border). He also effectively held the Xiongnu raiders to the north in check, although having the benefit of the Great Wall must have played a role in that. Economically, he introduced the Wu Zhu coin which would remain the standard currency in China for the next 700 years, and he officially opened the Silk Road which brought unprecedented wealth into his country. He was an advocate of Confucianism and required that all his advisers be taught in Confucian thinking. At the same time, Buddhism spread in China considerably under his reign. Politically, he was also an autocratic ruler who strengthened central authority and deprived local lords of most of their power. Under his reign, China would have to be considered one of the most powerful nations on earth.